Refined, brutal, crude and tender, King Arthur’s Night is a radical re-examination of the creative process and a kick in the knees to our assumptions about difference. 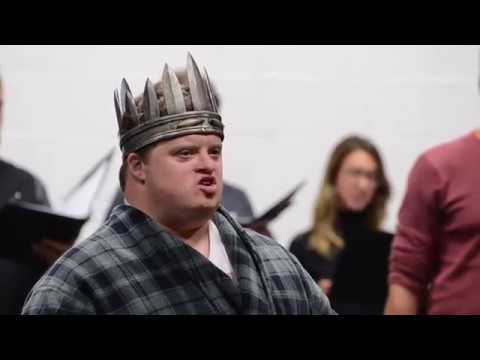 This ambitious work of theatre and music is co-created by Niall McNeil, an artist living with Down syndrome, with Marcus Youssef and James Long (Winners and Losers at Canadian Stage) and Canadian alt-songstress Veda Hille (co-creator of A Craigslist Cantata in Factory Theatre’s 2013 season). The integrated cast features a mix of actors living with and without Down syndrome, a live band, and a sixteen-person choir. King Arthur’s Night tests what we know about the limits of theatre, language and our collective understanding of the narratives that are permitted to shape our world. Commissioned by Luminato, Co-produced by the National Arts Centre (with the NAC Collaborations Program), with the major support of Stratford Festival and Bard On the Beach Shakespeare Festival. Community Partner:Down Syndrome Research Foundation of BC. Associate Presenter: Why Not Theatre. Neworld Theatre Society acknowledges the support of the Performing Arts Residency program at Banff Centre for Arts and Creativity. The Playwrights acknowledge the assistance of the 2016 Banff Playwrights Colony – a partnership between The Banff Centre and the Canada Council for the Arts. We are grateful for the support of the Shadbolt Centre for the Arts, who provided a Production Residency. Neworld Theatre acknowledges the generous support of the Canada Council for the Arts, the BC Arts Council, the Province of British Columbia, the Vancouver Foundation, the Hamber Foundation, the Koerner Foundation, Vancity, Inclusion BC, and our many individual and private donors. Niall McNeil literally grew up in the theatre, at the Caravan Farm Theatre in British Columbia’s interior. He appeared in numerous Caravan shows and had a long, productive collaborative relationship with Vancouver’s Leaky Heaven Circus. Niall’s genius as an artist is his ability to associate, and to create through dialogue and play, with a seemingly preternatural ability to riff and shift perspective, subverting expectations. The results of this are counterintuitive, absurd, disarming, confusing, hilarious, frightening and occasionally heart-stopping. In the world of King Arthur’s Night there is a permeable boundary, between the source material, pop culture and Niall’s own world. He is a gifted associator, making links between characters that defy traditional categorizations like fictional and real. Niall challenges the classifications and categorizations that we “neurotypicals” assume must be the only legitimate means available to perceive and name the world. They’re not. There are worlds we can’t name or even imagine, within every one of us. That’s why we have art: to offer ourselves a glimpse. The Relaxed Performance is offered to all patrons who would benefit from a more relaxed environment; those with sensory and communication disorders, a learning disability and/or an Autistic Spectrum Condition are especially welcome. Adaptations to the performance include house lights kept on low, adjustments to volume and special effects in the performance, and a relaxed attitude amongst audience, staff and performers to noise and movement around the theatre during the show. A full visual story will be available two weeks before the performance. A quiet area will be available for those who need to leave their seats before or during the performance. Please be aware that loud noises will occur during this Relaxed Performance. For patrons, who are disturbed by loud noises, we offer the option of following along with an "headphone interpreter". The interpreter will be sitting to the right of the stage or stage left in the theatre. The interpreter will signal to patrons when a loud noise is about to occur, by putting on a set of head phones. The patron will then have time to put on their own set of headphones (or ear muffs) so the volume of the potentially disturbing noise is reduced. Please note that patrons must bring their own noise reducing headphones. N: I like King Arthur because he’s strong. Respectful. And he sounds harsh. Harsh is kind of when he’s upset ... why he’s upset because Mordred his son is trying to destroy his kingdom. I like little parts of Mordred, not the war. I like Lancelot ... ‘Hello! Bonjour!’. Like he comes from France. He speaks French. There’s a scene of Arthur and Lancelot and Lancelot has an affair with Guine- vere ... And that’s why Arthur is harsh ... My production is going to have fog machines. N: You heard of a place called Harrison Hot Springs? N: It’s because we need a fog machine. It’s mineral water. You sit on it. Just soaking your body. It’s going to be in the play. Half the castle is, not the whole castle. I’m going to have a little Gollum, from Lord of the Rings. You know, Gollum? C: I think that’s a cool idea to do King Arthur, with elements of Lord of the Rings. N: I like to mix stuff around. C: What character do you want to play? N: King Arthur. He was a teenager and he wants to become a king and a knight. He will take the sword out of the stone and there’s going to be like light, light, light. And all of the knights become human. They were goats and then they are human. That’s from my production ... it’s kinda like a big journey to find the grail. A big, long journey.